This engagement should not be confused with the Battle of Preveza in 1538. 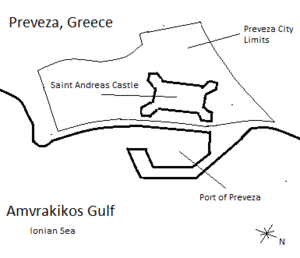 The Battle of Preveza, in September 1911, was the first naval engagement fought during the Italo-Turkish War. Five Italian warships encountered five Ottoman ships off the Greek port of Preveza. Over the course of two days, four of the Turkish vessels present were sunk or captured and the city was bombarded. On September 29, just after the beginning of the war, the Italian fleet in the Ionian Sea began searching for Ottoman warships. At about 4:00 pm, an hour or so after war was declared, five Italian destroyers under Prince Luigi Amedeo, sighted two enemy torpedo boats at sea in between Corfu and Preveza. Outnumbered, the Ottomans opened fire but soon after chose to flee without making any hits. The torpedo boat Tokat steered north chased by three destroyers while the Anatolia headed south followed by the remaining two Italian ships. After several moments of firing the Tokat ran aground near Nicopolis. She had been hit fifteen times, caught on fire, and was completely destroyed by additional Italian rounds. Nine men were killed, including the ship's captain. Anatolia was capable of escaping her pursuers without being damaged. Over 100 3-inch (76 mm) shells were fired by the Italians in this first engagement and afterwards three of the destroyers continued on with their patrol while the Artigliere and the Corazziere proceeded to Preveza and arrived a couple of hours later. That night an officer of the Corazziere went ashore secretly to observe the Turkish defenses before attacking the following morning. Two more Ottoman torpedo boats were in the harbor, the Alpagot and the Hamid-Abad, and the city was protected by the old stone Agios Andreas Castle armed with twenty-five modern artillery pieces. When the attack began the next day on September 30, the Italians engaged the Turkish torpedo boats first and sank them quickly without sustaining damage or casualties. All of the Ottoman crewmen escaped their ships except one man. A scuttled armed yacht named Tarablus was also at Preveza and the Italians captured her while under fire from civilians on the shore. The Corazziere then fired on the Turks and drove them off. Ottoman troops in the castle were completely surprised by the attack and offered no help in defense of the city though the Italians fired seventy-six rounds into the structure and heavily damaged its sea wall. After a forty-five-minute engagement, the two destroyers sailed for friendly waters with their prize in tow. 1 2 3 4 "Full text of "The history of the Italian-Turkish War, September 29, 1911, to October 18, 1912"". Archive.org. Retrieved 2012-02-10.